The FACOM 230-75 APU (for array processing unit*1) was Japan’s first vector computer. Examination of the FACOM 230-75 APU began in 1973 under the leadership of Ikeda Toshio, and after many changes in methodology, functions, and architectures, it was completed in 1977. The computer was installed at the National Aerospace Laboratory of Japan (which became the Japanese Aerospace Exploration Agency (JAXA) in October 2003) and began operating in August 1977 just one year after the CRAY-1 supercomputer was introduced in the United States. *1. Array processing refers to the processing of array data, either in vectors or matrices. (i)	The FACOM 230-75 APU and the general-purpose FACOM 230-75 large computer consisted of asymmetrical multiprocessors and shared main memories. (ii) The machine cycle time was 90 nanoseconds (11 MHz) and it had three pipelines: an addition pipeline (single-precision, 22 megaFLOPS), a multiplication pipeline (single-precision, 11 megaFLOPS9, and a logic operation pipeline. (iii) The data types were fixed-point decimals and single-precision, double-precision, and quad-precision floating-point decimals. (iv) It had 256-word general-purpose registers, 1,792-word vector registers, and a 2,048-word cache memory. (v)	The main memory consisted of a 32-way interleaved memory of one megaword by 36 bits. ACOM 230-75 APU added an APU monitor function to the FACOM 230-75’s MONITOR VII operating system. The APU itself ran part of the operating system, which enabled efficient operation of the asymmetrical multiprocessor system. (a)	The compiler made effective use of multiple general-purpose registers and vector registers to boost execution performance. (b)	The compiler made it possible to load and store not only consecutive vectors but also stride vectors and list vectors and to vectorize calculations. (c)	The compiler made it possible to vectorize if statements in do loops using vector gather and scatter commands. (d)	The compiler enabled parallel inputs and outputs of files with external memory devices (magnetic disks) without buffering. Although (b), (c), and (d) above are standard on today’s vector supercomputers, they were cutting-edge functions in 1977. Cray supercomputers did not support functions (b) and (c) until the Cray-XMP, announced in 1983. The FACOM 230-75 APU outperformed the FACOM 230-75’s CPU by five to ten times in speed when executing client applications run in 1977 for wind energy, atomic energy, and meteorological calculations. 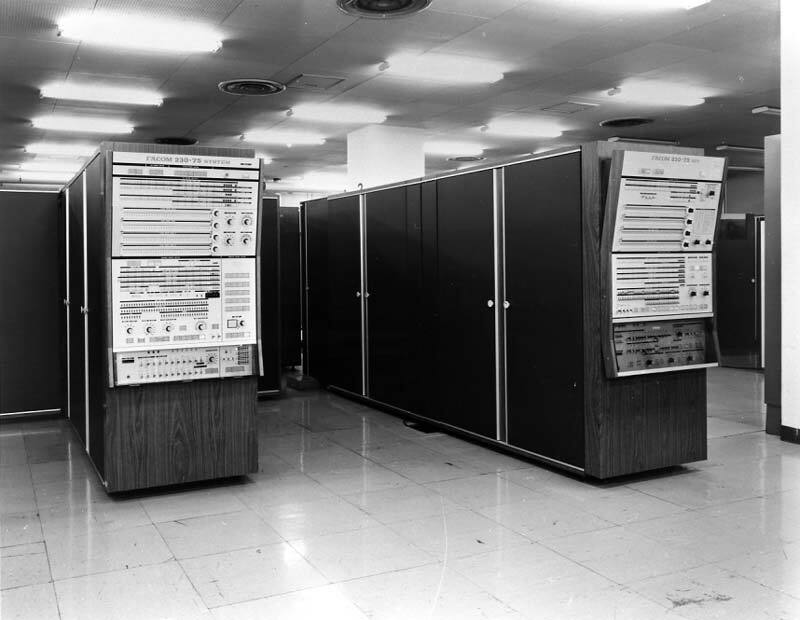 With one client application, the performance was measured at three to five times faster than the FACOM M-190 general-purpose large computer, which was held to be the world’s most powerful in 1977. Fujitsu examined the FACOM 230-75 APU’s design jointly with Miyoshi Hajime of the National Aerospace Laboratory of Japan. *2 The hardware specifications associated with accelerated application execution and the specifications of the application description language, AP-Fortran, were established under Miyoshi’s direction and guidance. Miyoshi was a strong advocate of the necessity of running aerodynamic calculations at higher speeds. *2. The National Aerospace Laboratory of Japan has had an enormous role in the advancement of Japanese supercomputers, including the joint study of the FACOM 230-75 APU’s development and the later development of the NWT parallel supercomputer, which went into operation in 1993, that was grounded in experiences with numerical aerodynamics simulations. Fujitsu gained invaluable insight into large-scale scientific computers from the development of the FACOM 230-75 APU, and this became the foundation of Fujitsu’s FACOM VP-100 series of supercomputers.